Representatives from more than 20 independent academic libraries in New York State met in Syracuse in April 2001 to discuss the possibility of resource sharing through a joint catalog using Innovative Interfaces, Inc.’s INN-Reach. While there was interest in the initiative, there was concern about the cost of such a system. Five libraries decided to underwrite the implementation of a pilot project to assess the benefits of statewide cooperation: Colgate University, Rensselaer Polytechnic Institute, Rochester Institute of Technology, St. Lawrence University, and Vassar College. The pilot project was named “Connect New York” (ConnectNY). The group worked with Innovative Interfaces, Inc. (III) to receive favorable pricing for a one-year pilot using INN-Reach. They then launched the pilot phase in the summer of 2001 by deciding on the types of bibliographic records to be included, circulation policies, and database technical parameters. In October 2001, 2.5 million bibliographic records were loaded into the INN-Reach catalog. The group also set up an expedited delivery system through the UPS 2nd-day service. In March 2002, the catalog was made available to patrons at the five libraries. In October 2001, with the pilot successfully under way, the group submitted a proposal for a planning grant from the Andrew W. Mellon Foundation. The grant proposed a series of meetings on all aspects of the consortium, including governance, long-term financial sustainability, technical needs, and membership growth. ConnectNY received the grant, and proceeded with the important work of establishing the governance and future of the consortium. In 2003, ConnectNY submitted a grant proposal to the Andrew Mellon Foundation for $250,000 to assist with the initiation of the implementation plan. 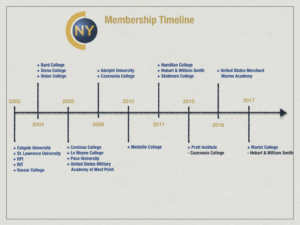 The grant was approved and within a year, ConnectNY’s membership grew to include Bard College, Siena College, and Union College. Four institutions joined ConnectNY in 2005: Canisius College, LeMoyne College, Pace University, and the United States Military Academy at West Point. Adelphi University and Cazenovia College joined in 2006. Rapid delivery of documents was investigated in 2008. ConnectNY member faculty and students were very happy with the ease of requesting and receiving physical materials. Extending this type of service to patrons for document delivery was a natural extension of ConnectNY services. The Council of Library Directors considered RapidILL, the IDS Project, and Article Reach as possible solutions. RapidILL was selected, and ConnectNY established the “CNY Pod”. As the consortium grew and it became necessary for CNY to establish a financial structure outside of a member institution, the Council registered the organization as a 501(c)3 nonprofit in New York State in 2009, at which time Bart Harloe became the first Executive Director. Mr. Harloe was the University Librarian at St. Lawrence University during the consortium’s founding and was instrumental in leading the group. Mr. Harloe set up the consortium’s business office and financial structure. He was Executive Director of ConnectNY until his retirement in January 2015. As e-books became popular, ConnectNY explored the possibility of managing a Demand Driven Acquisition (DDA) e-book pilot to provide members with a cost-saving way to add e-books to their collections. In 2010, ConnectNY began a DDA pilot with Coutts. ConnectNY now has a robust e-book program with content supplied by ProQuest and JSTOR. The program continues to evolve as platforms and models change. All titles purchased are available in perpetuity to the member libraries. In 2010, Medaille College joined ConnectNY, and in 2011, the first non-III integrated library system institutions joined: Hamilton College, Hobart and William Smith Colleges, and Skidmore College. 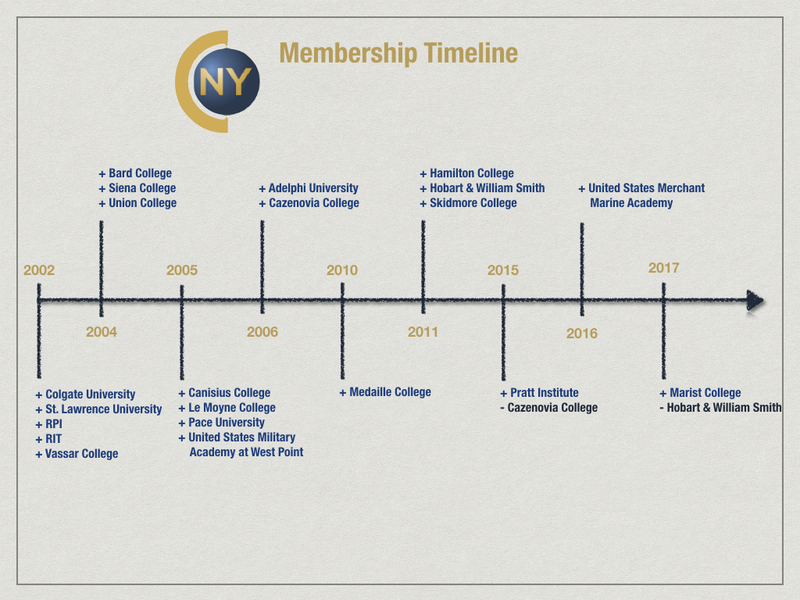 Membership has continued to grow as Pratt Institute (2015), the United States Merchant Marine Academy (2016), and Marist College (2017) have joined. Two institutions left ConnectNY: Cazenovia College (2015) and Hobart and William Smith (2017). Pamela Jones became Executive Director in February 2015. The Connect NY Strategic Plan 2015-2020 was approved in June 2015, and the Bylaws were updated in 2016 in accordance with changes in NY State nonprofit law. A robust Committee structure is now in place to insure involvement at all levels from member institutions. Since 2001, ConnectNY has grown from five to nineteen members, using INN-Reach, RapidILL, and Empire Library Delivery Service to effectively and efficiently share resources. A robust e-book program and shared print trust activities provide members with additional value. ConnectNY continues to grow and to pursue strategic initiatives that provide members with more opportunities to collaborate. The current bylaws were approved by the CNY Board of Directors on June 7, 2016 and are available for viewing or download from this link.